We've just got back from a great little break - things are very quiet just before Christmas so we headed up to Cooktown with our lovely friends, Di and Barry. 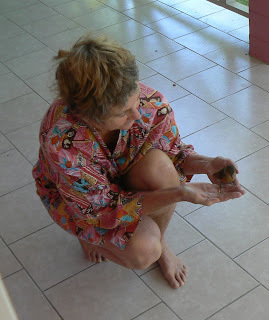 They have lived in Daintree quite a long time but this was their first visit to Cooktown. We've been quite a few times but it has been several years since we drove up and were astonished to find how much the coast road, up the notorious 4WD Bloomfield Track, has improved. The worst parts were some very steep hills and luckily all our rain has fallen further south so not much on the Track meant it was not at all slippery and the creeks crossing the road were all quite shallow - later in the wet season the road is often closed to all but local traffic. 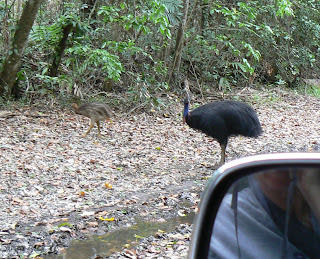 Barry and Di had never seen a cassowary in the wild so they were blown away when suddenly there was a male and it's chick calmly feeding right on the edge of the road. 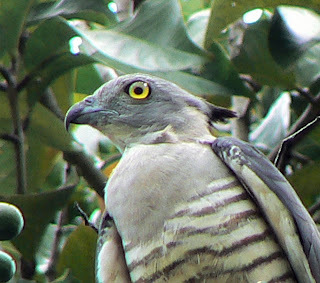 You can see how well camouflaged the chick is! The male cassowary rears the young until he mates again and when that happens the chick is immediately abandoned. A few years ago some guests of ours were lucky enough to see that actually happen and gave us copies of the photos. Later on I'll find them and add them to the blog. The 170km drive from Daintree to Cooktown takes just under four hours along the rugged coastal track - our return trip on the all-sealed 300 km inland highway took almost the same time! 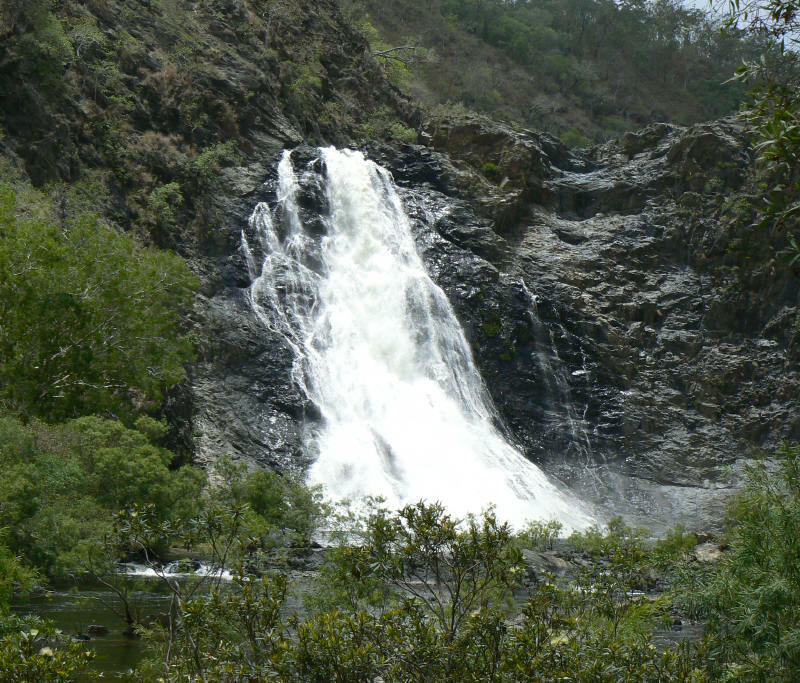 Stops along the way at beautiful Woobadda Creek, a call in to the incredible Bloomfield Falls - and this is what they look like at the end of the DRY season! - and a delicious lunch at the famous old, old Aussie pub, the Lion's Den. A must-do in Cooktown is a drive up Grassy Hill to the lookout over the Endeavour River and out over the Coral Sea. Cooktown is where Captain James Cook, who was the first European to set foot in Australia, hit a reef (well, his ship "Endeavour" did!) in 1770 and he landed at Cooktown to make repairs. Wonderful, wonderful rain - Saturday night we had 135 mm or almost 5 and a half inches. Very unusual to have this much so early in the season but boy, has it brought the rainforest to life again! It's now 8.30 am and the now-half-full dam is alive with frog calls, the valley is echoing with birdlife and everywhere is alive with beautiful butterflies. On Saturday morning the neighbour's horses were grazing on the young grass on the bottom of the wetlands-dam - and this was the view from 'Sunbird Sanctuary' the next morning! I'm still trying to photograph the elusive Buff Breasted Paradise Kingfishers - birdwatching guests have just spent three days trying to do the same thing, they saw five glimpses and that was it! We've had some wonderful rain in the past few days with a few 'wet season' type downpours and it has really brought the rainforest to life again. Amazing numbers of butterflies around and a million birds especially at dawn, and the grass is growing madly again so the mower is busy. 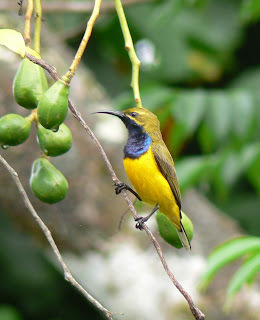 And of course lots of our favourite little Sunbirds - this little fellow was on the Tahitian Apple outside the office next to some of it's newly-forming fruit. Another 'thump' on the window this morning and there was a very dazed Little Shrike-Thrush lying on the verandah, yet another bird having flown into the glass. I gently picked it up and it sat on my hand for about ten minutes - another photo-opportunity, this time for Peter who had never used my camera before (we have a very good working arrangement - the remote controls for the tv and sound system are 'his' domain while he's happy to leave computers and cameras to me!) so he did very well! Finally, after depositing a 'message' on the rail!, it finally flew off. 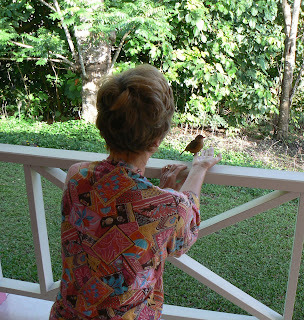 While I was holding it I caught sight of a flash of white as a Buff-breasted Paradise Kingfisher darted past. We are hearing their calls constantly now - in fact I can hear one now as I type.